Setting aside money in a 401k can be a smart way to save for retirement. Accessing your retirement account before you reach 59 and a half is never ideal, as you could face steep tax penalties that will take a big bite out of any withdrawal you might make. However, life has a way of hitting you with unexpected circumstances, and some people might think they have little choice but to take the hit and use their retirement savings for something they weren’t expecting. But what types of unexpected costs are forcing people to pay a penalty to access their retirement savings early? And are there better financial solutions to pay for unexpected expenses? GOBankingRates surveyed nearly 2,000 people who have made early withdrawals from their retirement funds to find out why they opted to tap into their nest egg earlier than expected. Read on to learn why people dip into their retirement savings early, and what better alternatives might exist. The GOBankingRates survey targeted 1,972 people who answered that they had withdrawn at least some of their retirement savings early. The most common answer by a wide margin is paying off debt or bills at 43.99 percent of those polled, with more than twice as many responses as the next most common answers. The second- and third-most common responses are paying for a financial emergency and medical expenses at 21.72 percent and 21.66 percent of responses, respectively, with the two responses garnering remarkably similar response rates. Bringing up the rear are purchasing a home at just 9.36 percent of answers and paying for higher education at a mere 3.27 percent of responses. It’s not surprising that paying down debt is such a significant reason for dipping into retirement. The same core principle that fuels the growth of your retirement savings — compounding interest — can also make the cost of carrying debt over time crippling to your efforts to save. However, there are other options besides dipping into retirement accounts. For example, respondents could use a personal loan to consolidate high-interest debt instead. That way, they can avoid the taxes and penalties associated with early 401k or IRA withdrawals, and pay off their expense with a fixed monthly payment at an amount and loan length that works for them. The reasons that drive people to make early withdrawals from their retirement accounts vary across age groups. 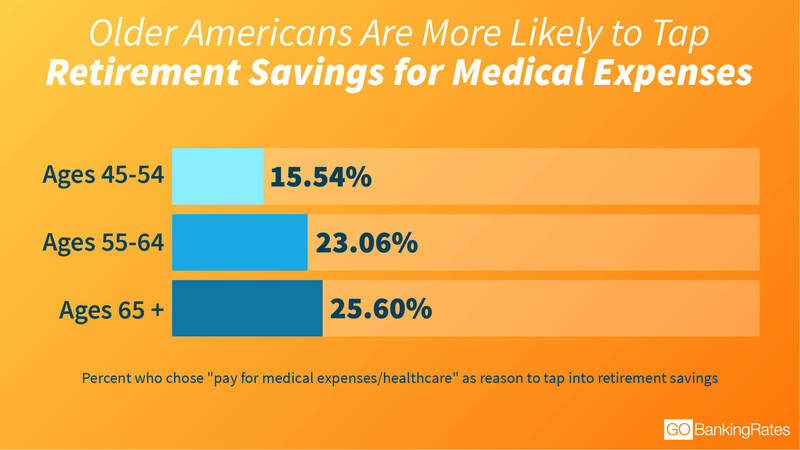 For example, early withdrawals for medical expenses increases significantly with age, with only 15.54 percent of those ages 45 to 54 giving that response, climbing to 23.06 percent for ages 55 to 64 and reaching 25.60 percent for ages 65 and older. Generally speaking, medical expenses increase with age, so the older you get, the more likely it is that you’ll have to deal with a major medical expense at some point in your life. If you don’t want to withdraw money from your retirement account, there are other options you can consider, such as personal loans. In fact, major medical expenses are a common reason people take out personal loans. The 2017 Discover Personal Loans Survey found that of those surveyed, 26 percent would most likely use a personal loan for a major medical expense. Higher education costs trended in the opposite direction, with the likelihood that people had made early withdrawals for that reason decreasing with age. Some 5.12 percent of those ages 45 to 54 tapped their retirement savings early to pay for higher education, falling to 2.84 percent among adults ages 55 to 64 and then 2.08 percent for those who are 65 and older. That could reflect the rising costs of a college education in America, which have more than doubled since the late 1990s. The 65-and-over group was likely paying tuition with an early withdrawal either for themselves or their children. A similar explanation could explain why the 45-to-54 age bracket is an outlier for the “to purchase a home” answer. The two older groups selected that option at 8.69 percent and 8.96 percent, but the youngest of the three is almost 20 percent higher at 10.6 percent. This could reflect rising home prices outpacing inflation by a wide margin. Home purchases by younger generations are more likely to have taken place at a time when costs were much higher and down payments were harder to come by than those who are over 65. Breaking the results down by gender also reveals some curious insights into why different circumstances might lead people to feel the need to bite the bullet and pay a penalty to use their retirement savings early. Men and women have nearly identical response rates for answers “to pay for higher education” and “to pay for a financial emergency.” However, women are more likely to use their retirement savings for medical expenses, with a response rate of 22.94 percent of women versus 20.26 percent of men. 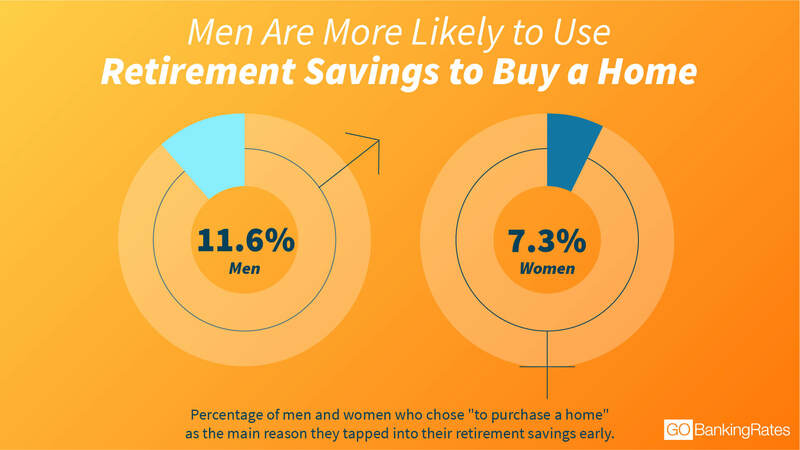 Men are significantly more likely to use retirement savings to purchase a home, with a rate of 11.64 percent of responses versus 7.29 percent of women. When Should You Tap Retirement Savings? So, when is the right time to withdraw from your retirement savings? In a word: retirement. Or, at the very least, after the age of 59 and a half. Retirement accounts are structured to help the average person avoid taxes when building a nest egg. So, the IRS punishes those people who pull their cash out before they reach age 59 and a half. Early withdrawals from your IRA or 401k are taxed as normal income plus an additional 10 percent penalty on top. When you consider that, a big withdrawal might bump you up a tax bracket even before the penalty, and the costs can be high — upwards of a third or more of the money you’re trying to access. There are a number of “hardship exemptions” that the IRS will waive the 10 percent penalty for, including $10,000 for a down payment for first-time homebuyers, medical emergencies, higher education costs and even certain financial emergencies. But even in those cases, you’re still paying normal income taxes on your withdrawal, and you miss the chance to let that money grow through investments. Clearly, there are unforeseen circumstances in which using your retirement savings might be necessary. Medical and financial emergencies frequently come without warning, and if you have significant debts with high interest rates, dipping into your IRA or 401k could be an attractive option for some. However, it’s still important to remember that two of the best ways to deal with debt are to spend and budget wisely or consolidate your higher-interest debt with a personal loan. In every case, turning to retirement savings is a costly consequence of failing to plan and prepare adequately — and there are usually better options available. When you consider the heavy tax penalties that come with pulling your money out of a 401k prematurely — as well as the opportunity cost of not letting that money collect investment returns — a personal loan could be a lower-cost solution in the long run. You can pay the money back with fixed monthly payments and a set interest rate determined when the loan is originated. This simple option avoids those tax penalties and leaves your retirement savings where they should be: earning even more money in your retirement account. Additionally, many personal lenders, like Discover Personal Loans, let you choose your loan amount and term. Discover also offers another important feature that not every lender does — zero origination fees. In a Discover Personal Loans survey, 22 percent of respondents cited the biggest benefit of a personal loan is lower interest rates as compared to other borrowing options and 21 percent cited it as a quick way to get money. Meanwhile, 68 percent of those who took out a personal loan said it allowed them to accomplish their financial goals. Additionally, some of the more common uses of personal loans were the same circumstances that led people in the GOBankingRates survey to tap their retirement savings early: Over one in four people used a personal loan to cover a medical expense, and over one in five used it for debt consolidation. Personal loans can be a simple alternative to accessing retirement accounts early when paying down debt as it consolidates all of your higher-interest debt bills into one fixed monthly payment, ideally at a lower interest rate than your other debts. Personal loans can also offer you funds fairly quickly with fixed-interest rates and a set repayment period. Personal loans are not taxed, and some lenders, like Discover, can pay your creditors directly, taking the financial burden off you to pay all bills. All in all, an IRA or 401k is an excellent tool for building your net worth in preparation for when you retire, but it’s not an efficient way to cover emergency expenses or pay down debt. Consider tapping a retirement account as a tool of last resort. Keep reading to learn more about retirement accounts. Methodology: This survey was conducted via Survata and collected responses from 1,972 people. 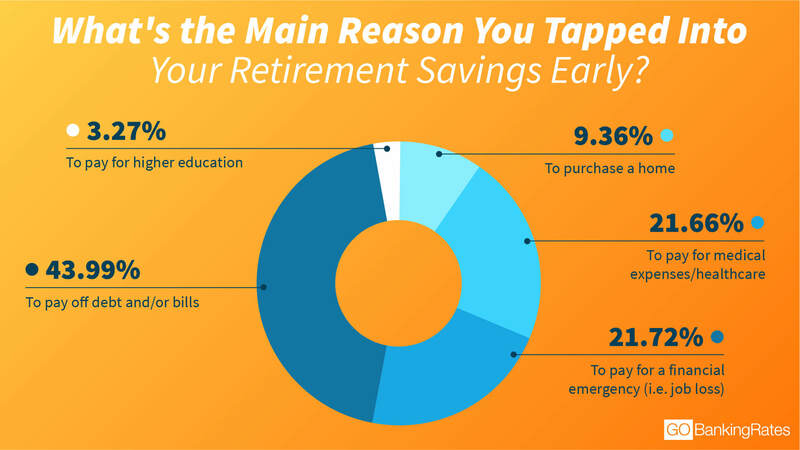 The survey posed a screener question, “Have you tapped into your retirement savings early?” Those who responded “yes” were then asked, “What’s the main reason you tapped into your retirement savings early?” and could choose from the following answer choices: 1) to pay for a financial emergency (e.g. job loss), 2) to pay for higher education, 3) to pay for medical expenses/healthcare, 4) to pay off debt and/or bills and 5) to purchase a home. The findings are representative of the U.S. online population with a margin of error of 4.50 percent. This survey ran and collected responses from Feb. 24, 2018, to March 1, 2018. This couple punched out and turned to life on the open road.